Disney Dream Extended Review Part 3... Fine Dining. | Daddy's in Charge? 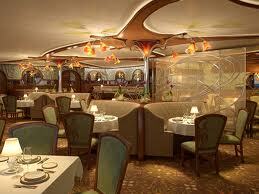 Disney Dream Extended Review Part 3... Fine Dining. In my last post I covered the everyday restaurants onboard the Disney Dream, and for most, those restaurants were more than enough to satisfy people's fancy needs. However for those who want a little bit more there are two restaurants that offer fine dining at a price. Palo, as most know, is the Northern Italian Restaurant and Remy is the gourmet French restaurant. Palo is offered at an extra charge of $20 while Remy is an extra $75. Most people know that the food in Palo is tremendous so coughing up the extra $20 is not a big deal. I am sure there are a lot of people that are a little skeptical about what Remy offers for that extra price. I will tell you that it is worth every penny. First thing that I will say is that the restaurant was not crowded at all. I know that they want to keep the numbers down to maintain a more intimate atmosphere, but I do think that the price is something that is scaring people away. I noticed many empty tables and we started our dinner at 7:30 and there was only one other couple in the restaurant went we left at 10:45. Since this is such a new restaurant I think maybe the price should come down a little bit. $150 for a couple plus a bottle of wine, and all of a sudden your bill is well over $200, thats way too much to ask of people that have already spent thousands on this cruise to begin with. Then again they get people to pay a premium for booking shore excursions through the boat so they probably feel people will pay the price. As for the $99 wine pairing, my wife thought that was for a couple, but alas its an extra C note PER PERSON. This must be a place only for Concierge level folks. Gentlemen will need a jacket to dine here, I used to bring a suit on these vacations but just started to think it was too much of a hassle to pack, plus with the mess kids make its really not worth it. Have no fear though, if you do not have a jacket one will be provided for you. So now that we have gotten all that out of the way lets get down to the dinner. Before we could actually get our food of course we had to worry about our wine, the prices range from expensive, to ridiculously expensive. There is one wine on the list that you might recognize from the movie but I don't think that bottle will ever be sold. Of course we are talking about the Chateau Cheval Blanc 1947. As you will recall Ego orders that bottle to go with his meal when he reviews Gusteau's restaurant. I would have no idea what that meant from watching the movie but it's apparently an expensive bottle of wine. It's somewhat of a benchmark wine in that wine snobs will travel thousands of miles just to get a taste of it. On the boat they have one bottle that you can consume for $25000. I am sure that its fantastic, but at that price I could NEVER enjoy it. It's a safe bet that that this bottle will be "on display" for years to come. Disney, while they would love someone to spend that kind of money on a cruise, probably hopes that no one buys this because they are apparently hard to find. 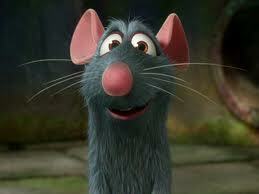 The first course that we had on the evening was, you guessed it, ratatouille. It was a nice dish but not one that gave me flashbacks to my childhood, I honestly could have skipped this dish but as you can see this restaurant is keeping to a theme here. It was just the first of many courses that we had. You could have as many courses as you wanted with this meal but the more you eat, the longer the meal takes, and Kids Club does close at 1:00am. There are many places that you can go to find the menu, including Disney's own website, so I will not bore you with everything that they have to offer. There are a couple ways of ordering, the ridiculous wine pairing menu or the ala carte menu. My wife and I chose the a la carte menu for obvious reasons. Being able to pick and choose, even though they said they would offer a wine pairing for each course, is the way to go. I can only imagine what the price would be if we strayed away from their suggestions. Again there is no shame in ordering a bunch of different things, after the $75 cover charge there is no limit to what you can eat, so you might as well try everything. As for myself, if you read any of my previous post on the other dining rooms, you will know that I am a beef and seafood kind of guy. Everything they had was very much to my liking. 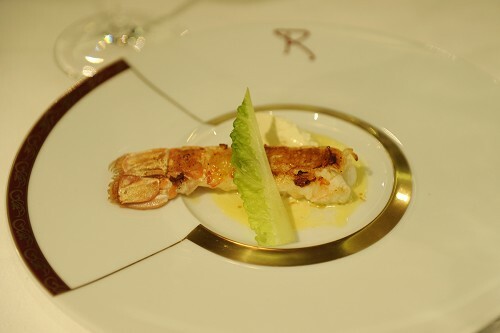 The first dish that I had was the Langoustines Royale. I am sure that you have it in your head that this some giant Lobster tail, but this was a lobster plucked from some Norwegian midget lobster farm. It was small but good. And since I couldn't get enough Lobster I ordered that next, I probably should have ordered two. In fact I should have ordered two of everything, the food was that good. The Australian Wagyu was probably the best beef I had eaten in my life. I don't know why I had never heard of it before this cruise but I remember thinking that it didn't even seem like beef, it was so tender there was no way that this could be something that I eat all the time. When they say something is like butter I think that they had this dish in mind. It was crazy good. Chef Patrick came to our table and we asked him what his favorite dish was and he said it was the Declinaison Tomate, so of course if the chef recommends something we have to try it, and thank God we did. There were three different variations of tomato dishes that were pretty good, but it was the fourth that was unbelievable. It was the essence of tomato that came in a champagne flute that was the best of the bunch. It no way tasted like it looked. Apparently this takes two days to make mixing a bunch of tomatoes, oils, and spices and letting gravity takes its course through a cheese cloth. The result was the smoothest tomato juice you will ever taste in your life. Of course being a french restaurant they have to have some cheese course and I couldn't tell you what all the cheeses were but I don't like having cheese after my meal. It doesn't change the fact that it was an awesome meal just a preference of mine. We kind of flew through dessert as it was fireworks night and we were running late and we did not want to disappoint our kids. Again this meal was long and it could have been much longer, should have been much longer thinking back because I want to try more food. I guess I will save it for next time. Fortunately from what I could tell there were no rats running around preparing this meal. But honestly I wouldn't care if they did, it was that good. You will find a lot of people that think differently about this restaurant, again its just personal preference. For most people the regular restaurants are more than enough to satisfy their hunger. I overheard one lady saying that there was just too much food and none of it was something that she liked. Its going to be that way with a lot of people, you might love it or you might hate it. No one knows your tastes more than you do. I will tell you that I like to try different things and am usually never disappointed when I do, and this was a restaurant that I was certainly not disappointed in. Anton Ego says it best when he reviews Gusteau's. While Palo was fantastic, for a southern Italian chef cooking Northern Italian fare, I remember walking out of Remy feeling much more satisfied with what I had eaten. There will be people that swear by Palo and not give the new guy a chance and that is fine, not all food is for everyone. Some might not like it because its not Palo, it is the new guy. In this case though, new definitely is better. I love the site! When is your next Disney Cruise! Per person, how much tip would you leave for Remy, over and above the $75.00 charge? "after the $75 cover charge there is no limit to what you can eat, so you might as well try everything." If time permits, you are saying we can pretty much order everything off the menu, all you can eat basically? It would be a long meal... But I was told you could have everything on the menu. We didn't eat everything and it was 3.5 hrs.